Blog It Is Time For Back To School Dental Check Ups! It Is Time For Back To School Dental Check Ups! DID YOU KNOW THAT TOOTH DECAY is the most common chronic disease in children? An estimated 42 percent of children between ages 2 and 11 get tooth decay in their baby teeth, and it doesn’t stop there, with 59 percent of kids between 12 and 19 getting at least one cavity. Every visit starts when you walk in the door. We will great you with a smile and help you get paperwork filled out if needed. Then one of our highly trained hygienists will come out the waiting room and great your child. The hygienists are dental professionals that are trained in preventive dentistry. They clean teeth, do sealants, brushing instructions, help kids understand how to best brush and any special things they need to help make their teeth as clean as possible at home. When their cleaning is done Dr. Mark or Dr. Ellen McOmie will come do an exam on your child’s teeth. It isn’t just looking for cavities but their growth and development will be discussed. The need for orthodontics is assessed at every visit. If age appropriate the dentists will check the status of the 3rd molars or wisdom teeth and evaluate them for removal or decide if keeping them is best. We also look for opportunities to do preventive dental care. Things like fluoride varnish, sealants, take home rinses, etc. Every visit we meet with the parent that brings them to the office to talk about any concerns findings and answer questions. We will communicate with you the parent, you will never leave our office and have to ask your child “What did the dentist say about your teeth?”. As McOmie Family Dentistry nears our 20th anniversary we have been in business long enough to see trends among our pediatric population. When we have a family that brings their kids in as close to every six months as possible. There will be about a 90% chance those kids will go to college without having a cavity in a permanent tooth and they will have no fillings. 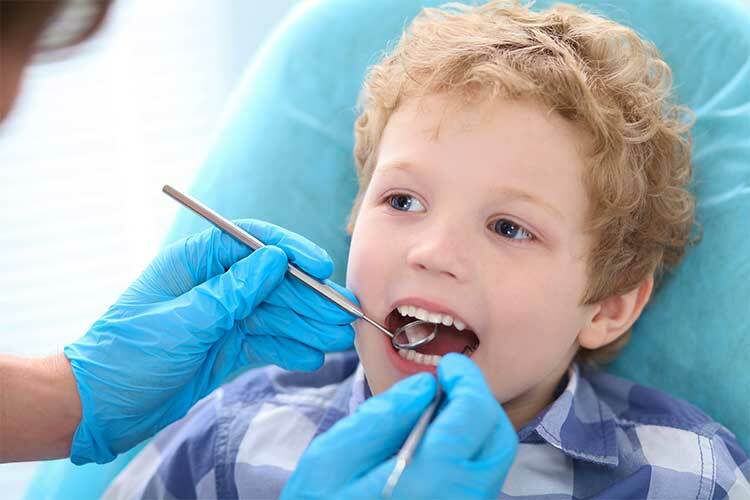 You see we don’t think having cavities is necessary and we will do EVERYTHING we can to stack the odds in your child’s favor against dental disease of all kinds. Brushing is always the foundation to good dental health. 2 minutes two times a day is what we recommend for all of our patients. For the younger set up to about 5 years old you should brush your child’s teeth for them morning and night. From 5-8 let them start brushing but you may want to brush for 30 seconds after they brush. Most kids don’t have the dexterity or attention span to really brush well. If you live in a non fluoridated area we recommend a fluoride rinse such as ACT mouth rinse. Fluoride will help re-mineralize areas of the tooth so they don’t grow into decay. Eating healthy and avoid high sugar foods is healthy in all aspects of a child’s life.